As seen in the video above, Amsoil Synthetic 15W-40 Diesel and Marine Oil deliver maximum performance, protection and cost savings for Nordic Waste’s fleet of refuse haulers. Went from 10 oil changes to 3 oil changes per year. Savings per year for 10 trucks… $3963.00. When this taxi cab company switched over to Amsoil they went from changing their oil every 2,000 miles to every 20,000 miles cutting their maintenance cost in half! Learn how switching to AMSOIL lubricants has saved Guardian Pest Control tens of thousands of dollars. 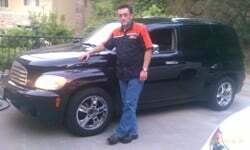 In the fall of 2008 Piero from Glendale, CA called and wanted to install the Amsoil products in his new Chevy HHR. He’d read about Amsoil on my Million Mile Chevy website. He installed the Amsoil 0W-30 synthetic oil in the engine along with a Wix oil filter. He had the transmission flushed and filled with the Amsoil synthetic automatic transmission fluid and installed a Wix transmission filter. He changes the Wix oil filter every 12,500 miles and the engine oil at 25,000 miles. In 2012 he replaced the Wix oil filter with the Amsoil EA15K oil filter (15,000 mile). At 100,000 miles he had the transmission flushed and filled with the Amsoil synthetic automatic transmission fluid and installed a Wix transmission filter. He called me in April of 2013…just to let me know while having his HHR oil changed at the local shop…the technician was surprised that he’d had no issues with the engine or transmission. The technician commented he’d done many repairs on HHR’s that had engine and transmission issues. But when Piero told the technician he changes the engine oil every 25,000 miles the technician was amazed. Piero is well on his way to proving like thousands of other Amsoil customers adding Amsoil products throughout your vehicle or equipment will make it almost immortal. And for Piero Amsoil has given him a fatter wallet $$$ and peace of mind. 1. Purchase Online Or Via Phone: You can purchase Amsoil products at retail prices by going to Amsoil online store or by calling Amsoil at (800) 956-5695 from 8 am to 5 pm Central Time, Monday – Friday. Thank you for using my ID#516778 as your referral. 2. Become A Preferred Customer: Save 25% off retail prices by becoming a preferred customer. Cost: $10 for 6 months or $20 for 1 year (Canada $30). When signing up as a preferred customer you’ll receive your own ID# giving you access to the online store to purchase all your products at wholesale prices. You can call Amsoils toll free ordering number at (800) 777-7094 to order at wholesale. Preferred Customers receive an information kit on AMSOIL products and the monthly AMSOIL Action News magazine containing powerful testimonies and updates about the Amsoil products. 3. Become A Dealer: Start your own business and become an Amsoil dealer. 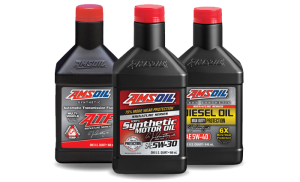 Cost: $50 yearly (Canada $65) save 25% off retail prices and share the Amsoil products with your friends, sign up Preferred Customers and Dealers under you and earn a commission off their orders. When signing up as a Dealer you’ll receive your own ID# giving you access to the online store to purchase all your products at wholesale. You can call Amsoils toll free ordering number at (800) 777-7094 to order at wholesale. PS: Most Japanese models take the Ea15K oil filter…good for 15,000 miles. If you drive over 15,000 miles a year…change the oil filter…no need to change the oil until 25,000 miles or one year. European cars … oil and filter need to be changed at the recommended mileage by the owners manual.